Our Beautiful triple layer, dye printed full color photo quality Purple Heart Flag. 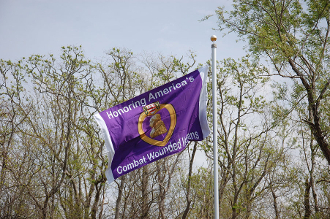 We created this Flag to Honor all Purple Heart Recipients, It was designed to resemble the Purple Heart Service Ribbon with White ends, and the Heart , Photo Quality and Large to show Honor. This Flag flies because each veterans last breath Lifts it up !